Follow the action here and on our Facebook page. Check out game highlights and links to our 2012 Photos. Sadly, we've not been able to finish adding game highlights for 2012, but we've continued in baseball mode making contacts with new teams and scheduling games for 2013 already. A team from Western Washington will be here at the end of May and the Alumni game is already scheduled for June 9. Start rounding up your crew guys! It was a beautiful day for a ballgame, and another, and another. Despite a little bit of rain early on, the sunny Yakima Valley lived up to its reputation and we got three great games in without a hitch. The Tri-Cities Pilots came out on top of a three team challenge in today's round-robin style play. They battled the Northwest Flyers in game one and took on the Portland Flyers in game two winning both. Both Flyers teams faced off in game three with the victory going to Portland. 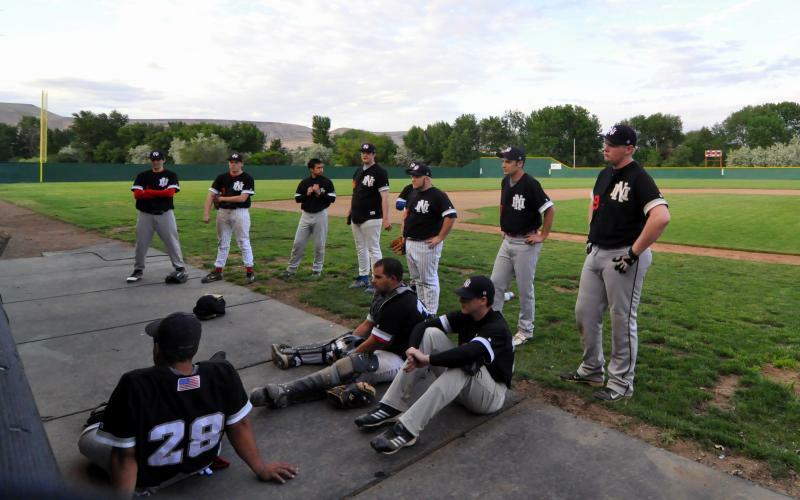 The NW Flyers faced familiar rival the Toppenish Yankees in a mid-week game bringing their win total to four for the season. Sorry, no photos for this game. There was lots of fun to be had by everyone today as the Flyers Alumni All-Stars came together for the second year to challenge the current NW Flyers. They gave all they had continuing a great tradition in spite of ending the day with two in their loss column. The future Flyers (Alumni kiddos) also had a great time chasing foul balls and running the bases (﻿click here to see the video﻿) for comic books, baseball cards, and treats courtesy of our awesome sponsor Ron's Coin and Collectibles. The NW Flyers dropped the ball today losing to the Mariners 4-10 in a make-up game after yesterday's rain-out. Despite the loss, the Flyers made nice plays, demonstrating improvement by several on the team. In spite of doing slightly better at the plate with 10 hits and only five Ks, the Flyers just couldn't turn hits into runs, leaving nine on base. The Mariners made the most of their nine hits, and a couple of miscues by the Flyers, overcoming eight Ks to get 10 runs across the plate while also leaving nine stranded. Sam Glazier led the offense going 4-5 with three doubles, followed by Chris Shogren 2-4, and Dion Tobia 2-5, with a triple. The Flyers also executed two double plays. The Flyers hosted the Yankees at home today and picked up their first win of the season. Several young ball players also took their turns around the bases scoring comic books and baseball cards from Ron's Coin and Collectibles. Nick Butterfield got the start for the Flyers pitching 4 1/3 strong innings allowing only five runs (two earned) and six hits with three walks and three strikeouts. Sam Glazier and Ryan Barber came on in relief combining for 4 2/3 innings, seven hits, five runs (Glazier two earned) three walks and three Ks as the Flyers held on to win 13-10. Flyers defense gave up a few runs trying to shake off early season rust, though they did make some outstanding plays. All Flyers starters either hit, scored a run or batted-in runs showing off their offensive improvements. Among those were Matt Summers who hit the first home run of the season and Sam Glazier who drove two hits to the outfield wall. The Yankees played heads-up infield defense and also shone in the outfield thanks to an outstanding effort by the left-fielder who laid out to make a great catch stealing a hit. Flyer Mike Yoest filled in for a short-handed Toppenish team, performing admirably, going 2-3 with 2 RBI and a run scored. Other notable Flyer efforts include Will Packard 2-5, 2 R, 1 RBI; Nick Butterfield 2-3, 1 R, 1 RBI; Matt Summers 2-4, 2 R (HR), 2 RBI. Game 1 - The Northwest Flyers broke out their bats going all wood this season as they faced the Yakima Devil Rays on their Opening Day. Matt Summers started for the home team Flyers pitching 2 1/3 innings. Those first three innings proved to be some trouble for the rehabing C.W.U. pitcher as he allowed six runs (three earned) on five hits with three walks and three Ks. Dion Tobia came on next throwing one hit and three Ks for 3 1/3 innings of scoreless ball aided by strong fielding performances by outfielders Anthony Allen, Ryan Barber, and Brian Griffith while turning in strong defensive plays himself. The Flyers dropped game one with a final score of 10-3, though they were just three hits behind the Devil Rays' metal work, banging out seven against YVCC starting pitcher, Derek Welton, and his relief, scoring three earned runs with three walks and six strikeouts. Drew Pettit got the start in Game 2 throwing four innings and allowing only three runs on four hits with one walk and five Ks. The Devil Ray's pitchers Burton, Fontenot, and Fowler held the Flyers scoreless through four innings until they rallied in the fifth putting up five runs. Nathan Villegas took over the mound in the fourth to close out the game giving up ten hits and six runs - just three were earned due to some early season defensive woes. The Flyers went on to be swept out of their Opening Day double-header despite several nice efforts by infielders Nick Butterfield and Austin Rodriguez. Our thanks to The Rib Shack Bar-B-Que for providing lunch for the Flyers and our about fifty of our fans - great pulled pork sandwiches! The Reds knocked out five hits against the Blacks' relief -- Nick Butterfield and Anthony Allen -- while holding that squad to just two hits with help from relievers Will Packard, "A-rod" Rodriguez, and Dion Tobia as well as an outstanding effort in center field by Brian Griffith. 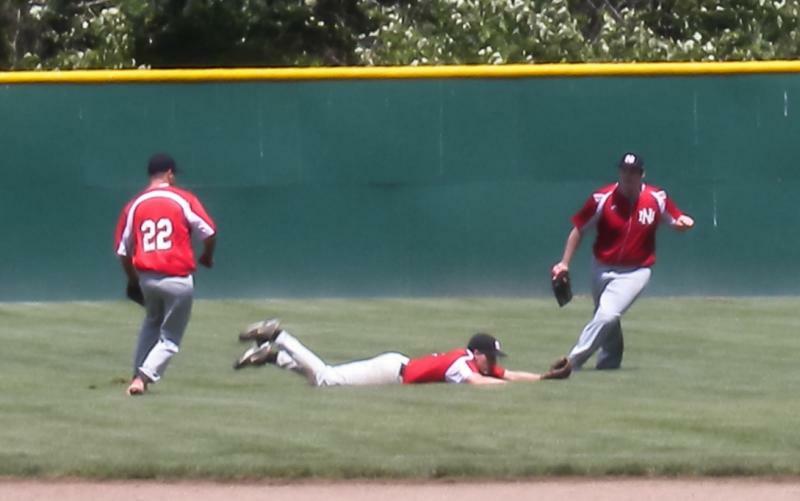 Griffith layed out to make a catch in the bottom of the seventh stranding two Blacks' runners and ending a two-out rally. Matt Summers also had at good day at the plate ringing up two hits and scoring the first run of the season. The Flyers Red went on score two more runs to win the game 3-0. 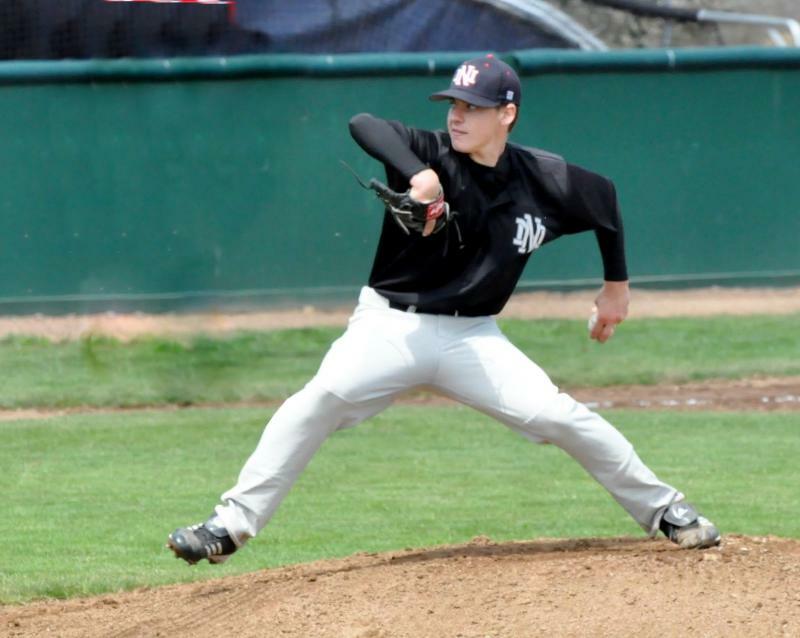 The Flyers' home opener will be Saturday, June 2nd at 1pm at Riverside Christian School against the Yakima Devil Rays. Photos are up. Submissions welcome. After two weeks of practice (see the first photos of the season here) and field prep, the 2012 Flyers are ready for Game 1 at noon on Monday, Memorial Day. The team will face-off in an inter-squad challenge putting everyone to the test. Family, friends, and fans are invited to Riverside Christian ball park to watch the fun and enjoy great food from our sponsor The Rib Shack Bar-B-Que who will be bringing something for everyone - Flyers and Fans!